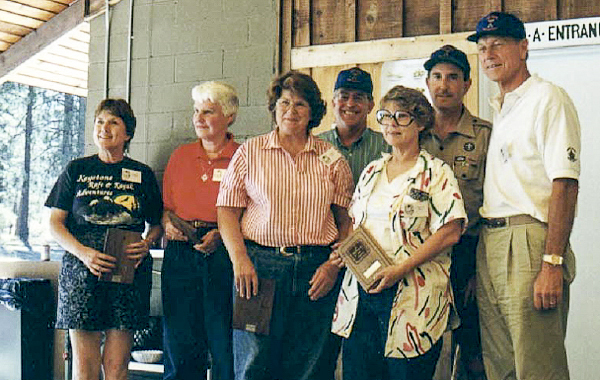 The Friends of Camp Whitsett started as the Camp Whitsett Alumni Association (CWAA), an organization of Staff, Scouters and Campers who had attended Camp Whitsett, with a goal of supporting the camp through fundraising and volunteer service, and planning reunions for the members. The idea for the CWAA came about as far back as 1994, when Steve (Putnam) Lombard, a Camp Whitsett Staff alumnus from the late 1970’s and early 1980’s, spent that summer as Business Manager at Whitsett’s sister camp, Emerald Bay, on Catalina Island. Steve made note of the high level of dedication and involvement of Emerald Bay Staff alumni, through their volunteer organization, Emerald Bay Alumni (EBA). Steve brought up the idea of forming a similar Whitsett organization to Jeff Feldman, a fellow Camp Whitsett Staff alumnus. Jeff was in favor of the idea, and together they took the idea to Jon Mackenzie at the Western Los Angeles County Council, who was also in favor. 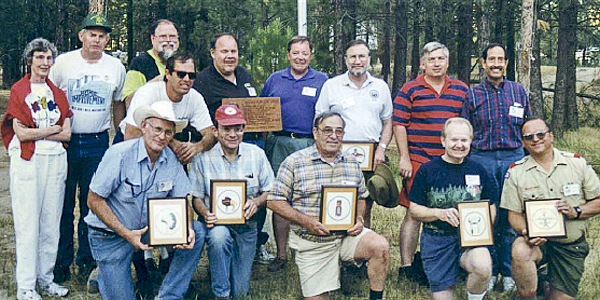 As the genesis of what was to become the CWAA began in 1995, so too did planning for Camp Whitsett’s 50th Anniversary Grand Reunion, which took place in 1996. Gathering staff rosters from as many years as possible, Steve and Jeff put together a mailing list, and sent out invitations to everyone on that list. On June 29th, Chuck Smith, whose career on staff had already spanned 3 decades and was still serving on staff, welcomed over 360 former staff and their families to this amazing weekend event, which brought together staff from the ‘50s, ‘60s, ‘70s, ‘80s, and ‘90s. The weekend was filled with reunions of old friends, tours of the camp, reminiscing about camp experiences, great meals, and ceremonies with speeches by Council and Camp administration, and a greeting by Myrtle Harris – granddaughter of both the Camp’s founder, W. P. Whitsett, and Guy F. Atkinson, the designer and builder of the Lake Ida Dam. The weekend program culminated with a Super Campfire, bringing together talent from almost 50 years. Pictures were taken of the various years of staff: photos of the Staff from each decade; photos of all the Program Directors; photos of all the Camp Directors; and various photos of some areas. [by the way – we’re looking for copies of those photos and any others to post on our website]. The weekend was a huge success, and, starting in 1999, reunions have continued to take place every summer. While attendance at these reunions has not been nearly as large as the 1996 Grand Reunion, the former staff and campers that do attend have enjoyed the events and have had the opportunity to witness the improvements to Camp Whitsett first hand. The formation of CWAA was announced at the Grand Reunion, but wasn’t fully realized until February 2000, when formal bylaws were adopted by the first Board of Directors, and the association was registered as a charitable non-profit association with the State of California. The Founding Board consisted of Jeff Feldman (President), Alan Rosen (Vice President), Steve Putnam (Treasurer), Jon Mackenzie (Secretary), Adam Lombard (Historian), Bob Hawkins, Hoss McNutt, Chandy Russell and Chuck Smith, with 2 positions unfilled. By 2002, the Board had reached its full capacity of 5 Officers and 6 Directors with the addition of Larry Monson and Jeff Teeter as Directors. As outlined in the original bylaws, all board members served simultaneous 2-year terms, except for one board position, to be filled by the Scout Executive of the Western Los Angeles County Council or his appointee. Elections for the board took place every other year, just prior to and during the reunion weekends. 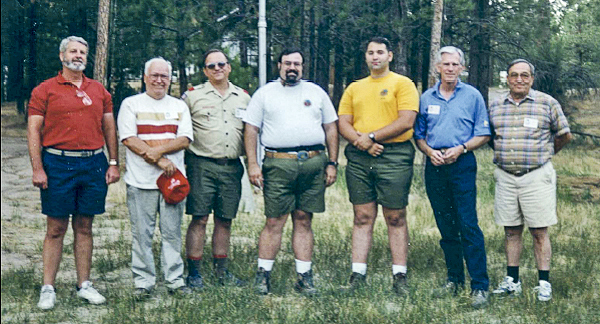 In 2005, a proposal was set forth to change the name of the association to Friends of Camp Whitsett, to better reflect the diversity of its membership, and encourage non-Staff alumni to become members. “Alumni Association” seemed to limit membership to only Staff Alumni (those who actually worked at Camp), whereas, the organization was open to ALL: Staff Alumni, Camper Alumni, as well as just “Friends”. This change was passed unanimously by the membership at the general meeting held as part of the reunion weekend, and the “Alumni Association” was reborn as the Friends of Camp Whitsett – or FOCW. In 2009, a new board with younger members was elected to lead FOCW, and in April of the following year, they held a Strategic Planning Meeting, with a goal to refocus and update the direction and growth of FOCW. The meeting resulted in the FOCW Mission Statement: “To identify, develop and harness people’s time, talent and treasure for the benefit of Camp Whitsett”, and a clarification of the objectives of the organization. Proposals were made for the establishment of committees to help with the ongoing objectives and the eventual growth of FOCW, along with new ideas to get the organization’s name and purpose out to more people. In 2012, the bylaws were once again amended, and part of those amendments increased the size of the Board from the original 11 members to 12, with each member serving a 3-year-term, and with 1/3 of the members going up for election each year. Another notable change was that the Board itself began selecting the officers each year from its own members, at its first meeting in the Fall – those officers being President, Vice President, Secretary and Treasurer. Those directors not filling an office volunteer to serve on the various committees that help FOCW complete its objectives. FOCW (and CWAA before it) has used a variety of methods over the years to raise funds for Camp Whitsett, from the traditional direct appeal for donations, to planning various fund-raising events, such as fund-raising dinners at local restaurants. Fund-raising campaigns have helped raise funds for specific camp improvements, such as the “Buy-A-Bench” campaign that raised funds to help renovate the Chuck Smith Campfire Circle. In recent years, FOCW has developed a standard slate of fundraising, including the fall Oktoberfest, which started in 2014, the spring All-You-Can-Eat Crabfest, which started in 2016, creation and sale of annual commemorative “Challenge” coins, as well as FOCW regalia, including a t-shirt, lapel pin, jacket patch and other items. The annual FOCW Family Weekend (aka the Reunion Weekend), and its accompanying memorabilia auction, also raises funds for FOCW. All of these efforts have raised tens of thousands of dollars, and all of that money has gone into improvements to Camp Whitsett.